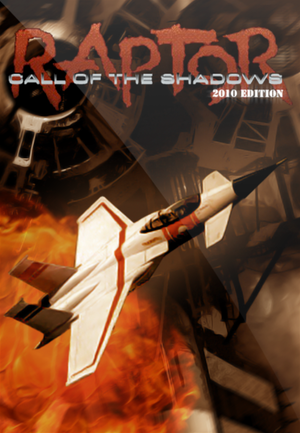 Enhanced port of Raptor: Call of the Shadows. 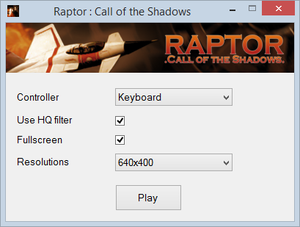 rapwin.exe runs the game directly but uses default settings unless parameters are specified. Make a shortcut to rapwin.exe. Click OK to save your changes. 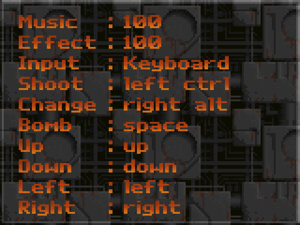 This shortcut will now launch the game with those settings. Syncs both saves and settings. 640x400, 960x600 and 1280x800 only. Upscaled from 320x200. The 2015 Edition only supports XInput controllers. Can't change axis mappings or use axes as buttons. ↑ 2.0 2.1 File/folder structure within this directory reflects the path(s) listed for Windows and/or Steam game data (use Wine regedit to access Windows registry paths). Games with Steam Cloud support may store data in ~/.steam/steam/userdata/<user-id>/336060/ in addition to or instead of this directory. The app ID (336060) may differ in some cases. Treat backslashes as forward slashes. See the glossary page for details. This page was last edited on 6 April 2019, at 04:12.